This weekend myself and Emily Hodgkinson (process worker, facilitator and Transition Leicester stalwart) co-facilitated a day and a half training for facilitators at Leicester’s Eco House. More specifically facilitators of the Transition Leicester Footpaths: Community Carbon Reduction project, which I’ve blogged about before. The group of 12 was made up of some people already experienced in facilitation and others completely new to it. The agenda was part orientation to the project, part orientation to working in groups and part practice of the core skills of facilitation. The excitement for me was getting to see, and work with, Emily’s approach. I was aware of process work, but not really familiar with it. One activity that extended the active listening that’s at the heart of most facilitation training I’ve delivered we called ‘Weather reporting’. That is sensing and then naming the state of the group – the mood, the energy, the vibe – call it what you will. Making groups aware of their collective energy, especially when it’s low or negative, has the power to transform it, or at very least allow them to do some conscious work to improve it. 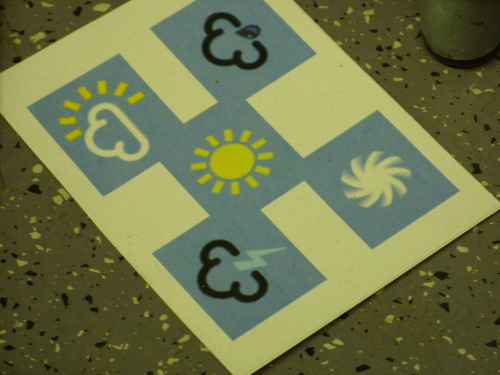 Participants raised weather cards whenever they thought it appropriate to comment on the groups ‘weather’. We also looked at groups as a collective entity using imagery and story. We explored rank and privilege in groups. And of course we gave participants the opportunity to prepare sessions from the Handbook and deliver them to each other for peer feedback and support. The quality of the delivery was impressive. Finally we looked at 2 complimentary approaches for understanding and dealing with ‘problem’ people and ‘nightmare’ scenarios. The evaluations were positive. Transition Leicester’s evaluation form used both scoring and space for comments. Over 90% of participants said that the training had lived up to their expectations ‘well’. No-one scored the training ‘poorly’, but sadly there was one person scored it ‘neither well nor poorly’. One too many. 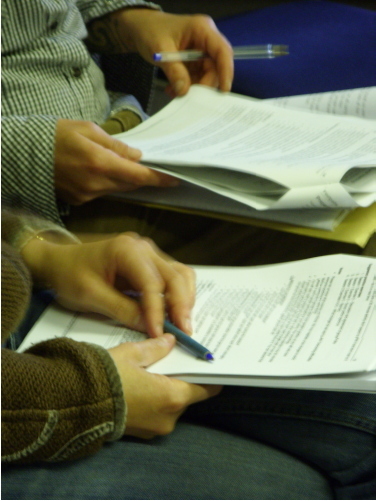 We’ve scheduled 2 follow-up drop-in sessions, one in October and one in November. Those will be the real test of the weekend’s work as participants will have facilitated 2 or 3 meetings of their Footpaths group by then. Let’s see what they bring us to help them troubleshoot….